A vision of sheer loveliness, this exquisite arrangement of light pink and hot pink roses in a luminous ceramic vase is a gift that will be long remembered. 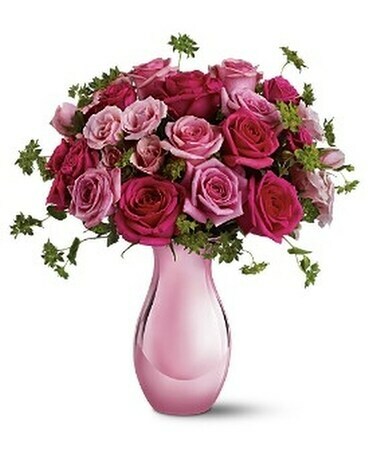 A bouquet of pink roses is a welcome gift for any special woman in your life. The lovely arrangement includes pink roses, hot pink roses, dark pink spray roses and light pink spray roses accented with bupleurum. Delivered in a graceful ceramic vase coated with a lustrous pink metallized finish.